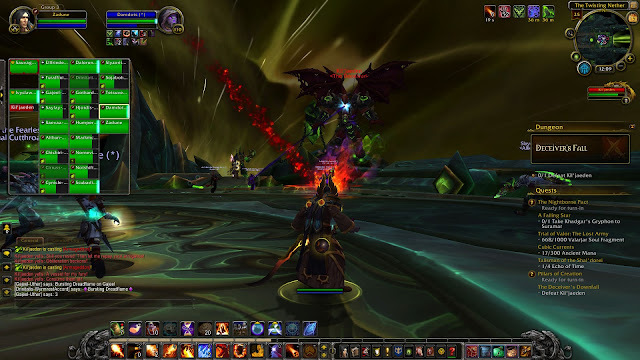 Revisiting World of Warcraft for the first time in a while...and whoa, the Legion expansion is pretty rad. When numbers get out of control. 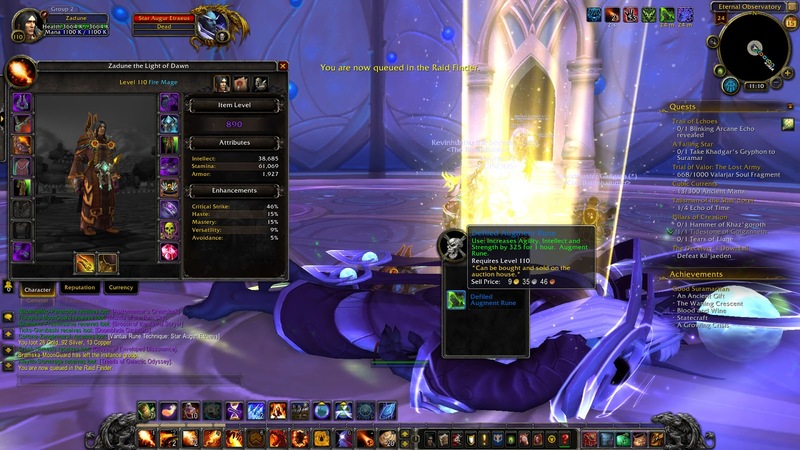 I checked out Legion when it first launched and you were lucky to get a few hundred artifact points at a time. As you progressed you'd gradually increase how much AP you got from expansion rewards. Now they've done away with the gradual and you just get a ton of AP right from the get-go. 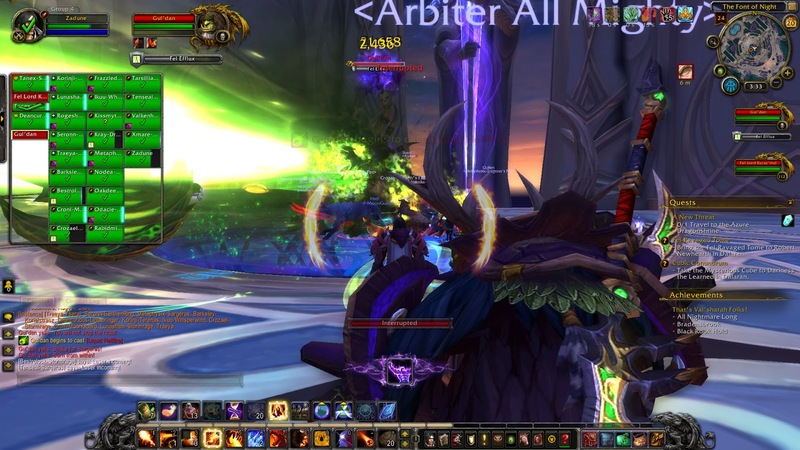 These are used to (rapidly, now) strengthen your artifact weapon. 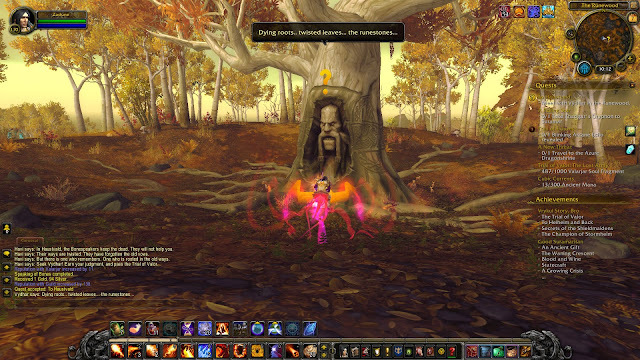 Great Everquest reference here. It's Fansy the Famous Good Bard. 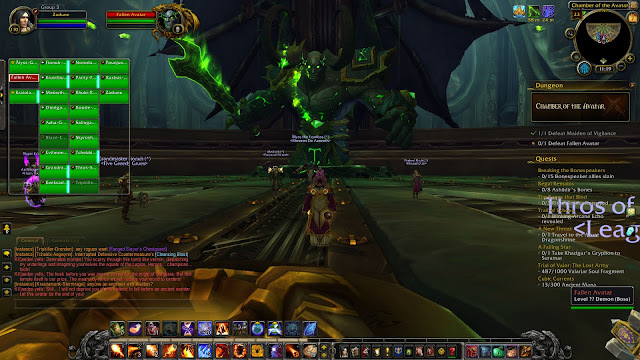 Circa 2001, he was a guy who played on EQ's PVP servers on the good race side and would run around training huge amounts of mobs onto evil race players who were minding their own business. 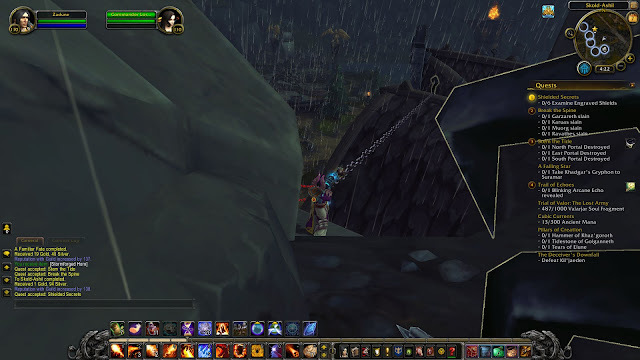 Players level 5 or below were immune to being attacked in PVP, so no one could do anything about him as he trained mobs everywhere with his bard runspeed boost. He'd shout in the channel about how he was saving the day for the Good Team, inviting massive amounts of scorn from the zone as he acted as clueless as 2000 Kurt Angle. This guy was such a problem that they had to completely overhaul how bard songs worked in EQ. 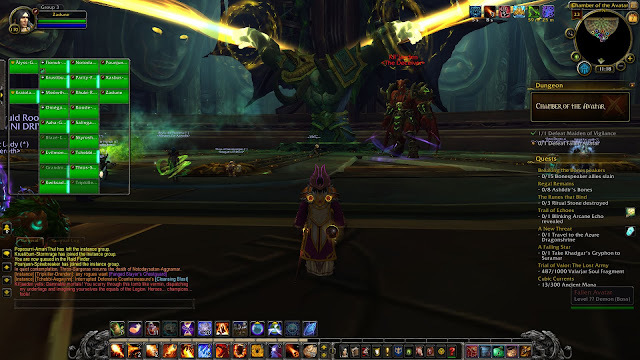 A guy asks how to leave a guild, and I explain that you don't... it's fo fo fo life. 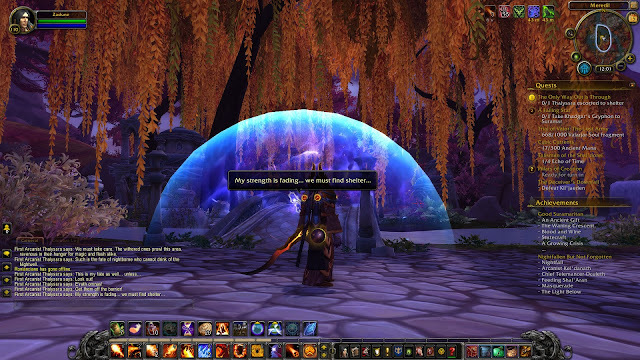 Speaking of WoW chat...very little has changed since the last time I popped on. 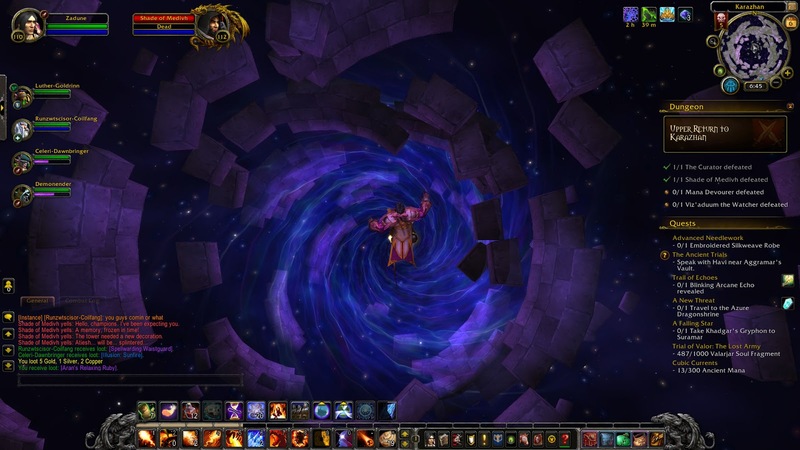 There are some cool new dungeons in Legion. Very other-worldly locations. The entire expansion revolves around fighting the Burning Legion, which means battles in space on top of Legion attack ships. 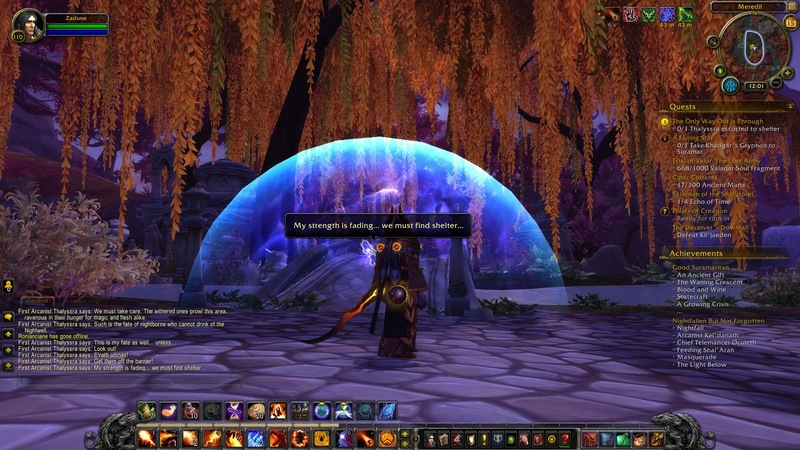 All things considered, this expansion gives us some of the best settings ever seen in WoW. 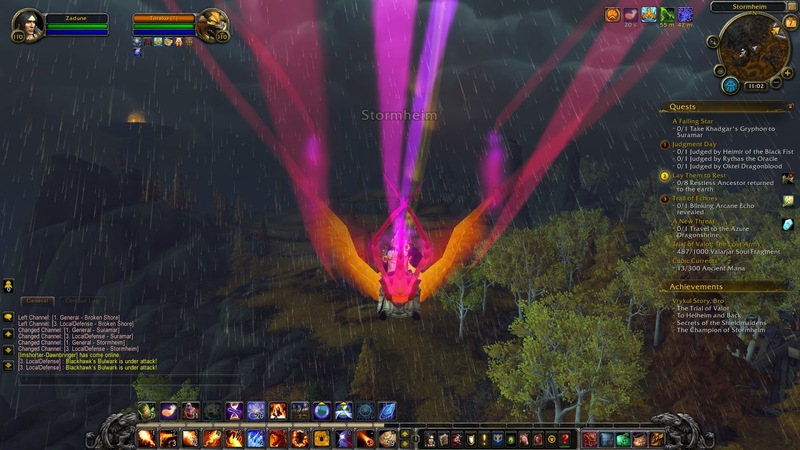 Legion consists of seven primary provinces: First, you've got the original four, which you can do in any order: The scenic tropics of Azsuna, the elf-y naturelands of Val'Sharah, the high mountain of Highmountain, and the stormy Nordic lands of Stormheim (seen here). 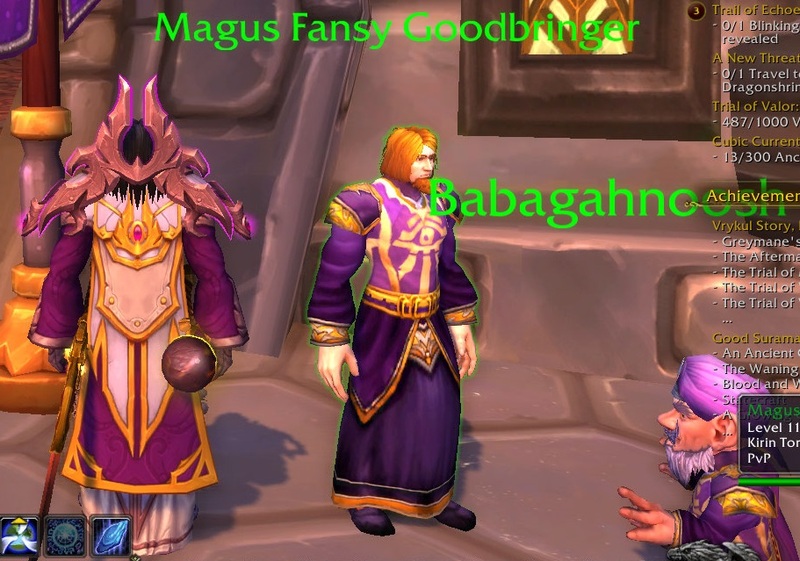 Any two or three of these four should get you from level 100 to 110, which is when it's time to start gearing up for further provinces. It's worth going back to the province(s) that you didn't do to finish everything, however. 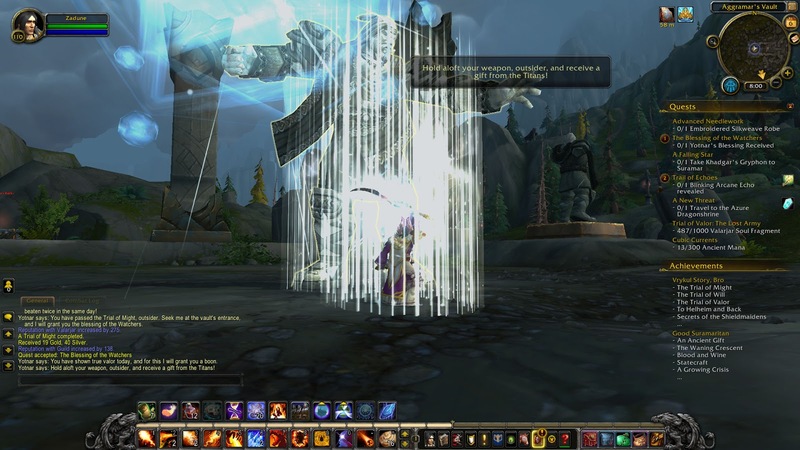 For me, Stormheim was the one I didn't get to, and I'm glad I went and finished it. This zone features the Hookshot from the Zelda series, and you need to use it pretty regularly to get from one part of Stormheim to another. It's a lot of fun to play around with, and isn't the only Zelda reference in this game by a longshot. 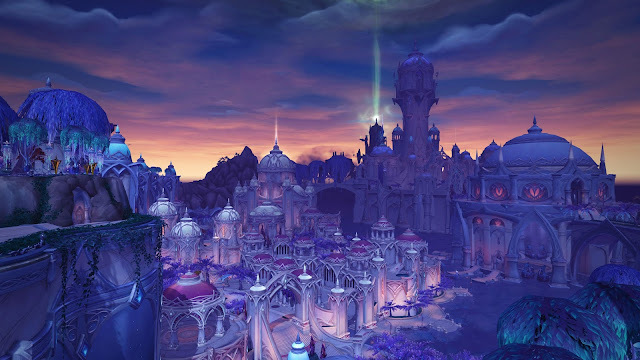 After those four, you've got Suramar. It's a very Night Elf looking city with a massive amount of content. 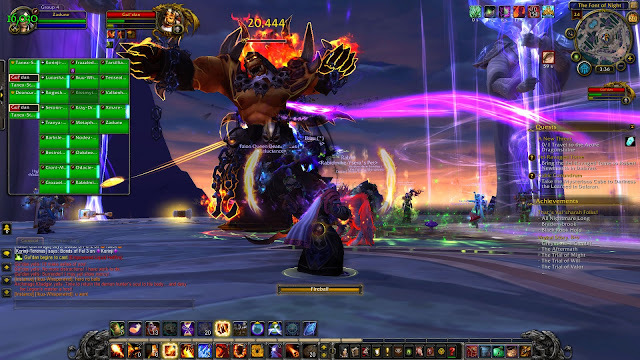 When the expansion launched, it was the pinnacle zone. Now it's in a similar boat to whatever you don't get to in the first four provinces: You can pretty much skip it, but you shouldn't. 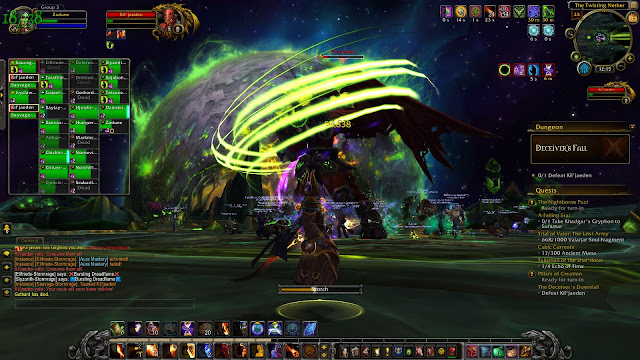 After that is Broken Shore, where you finally take on the Burning Legion directly in a fairly-controlled campaign of quests, followed by the Legion homeworld of Argus. 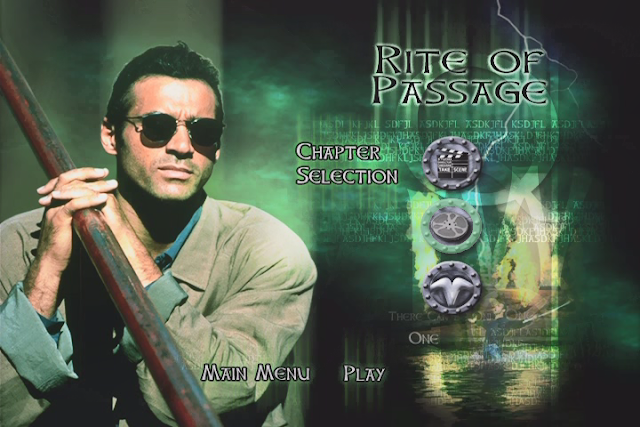 That final area actually consists of three interconnected zones. One thing that has always intrigued me: Talking trees with faces. I liked them when I read Lord of the Rings as a kid and I still do. Onward to the raids. I CAN DO IT! 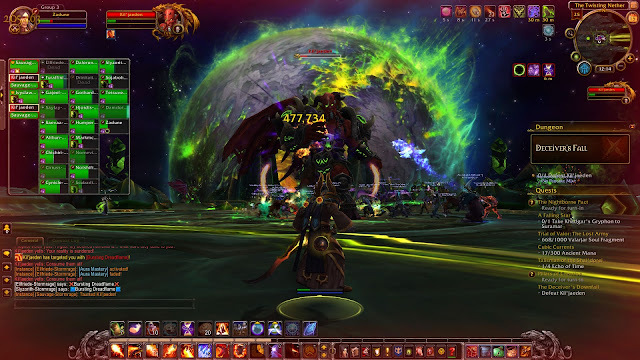 The first tier of raids are the Emerald Nightmare, a twisted version of the Emerald Dream that players have been asking for for years. This place is reminiscent of a Persona dungeon and has you fighting a bunch of dragons. 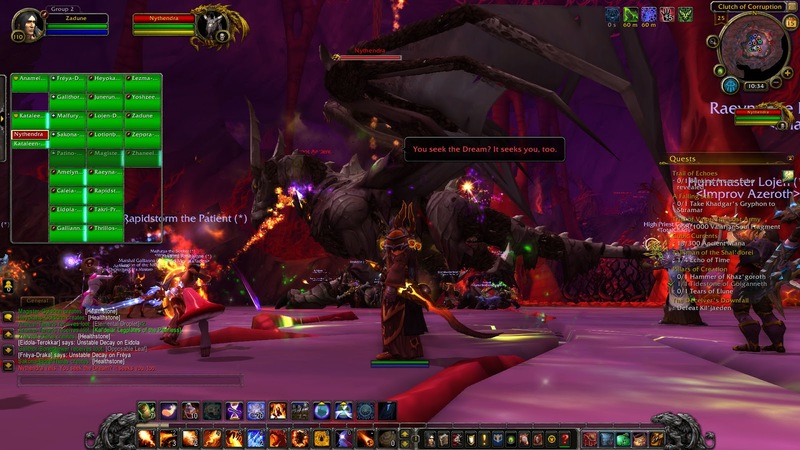 Dragons have always been under-represented in WoW aside from the two big bosses in vanilla. Considering that WoW is in some ways the more-accurate Everquest II, I wish it would have had more of a dragon presence (which characterized the first couple years of EQ before dragons became a non-factor in that game too). 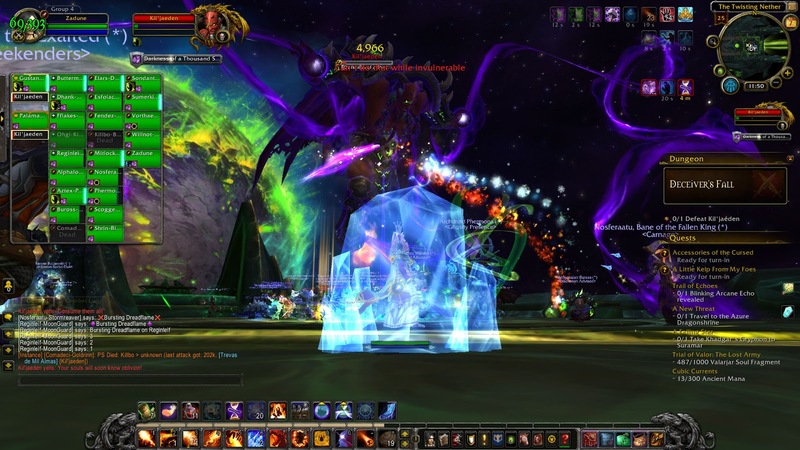 Moving on from the massive Emerald Nightmare raid, we've got a smaller raid that I guess can be considered Tier 1.5. It's the Trial of Valor, in which you battle Odyn (plzdon'tsue) followed by a descent to Hades to take on the nefarious Helya. As a Mage, these raid fights are low-responsibility blasts of fun where I basically just unload high-damage abilities as fast as I can hit the buttons. Then there's Tier 2: Nighthold, the palace of Suramar. This place is very scenic and very purple. It was added well after the expansion launch. In here, you fight some interesting bosses like Star Augur Etraeus, whose name sounds like something out of Bloodborne. The final boss of Tier 2 / Nighthold is Gul'dan, which wraps up the story of the previous expansion (an expansion that I don't think anyone was really a fan of). 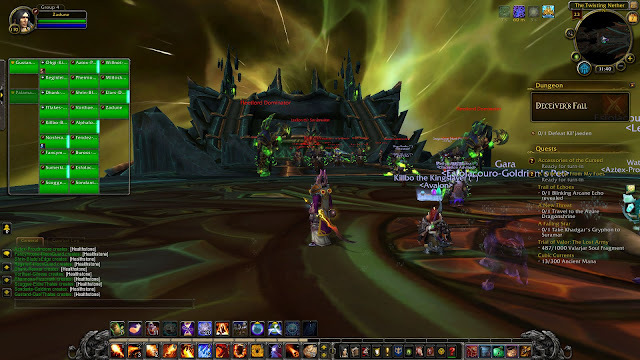 Gul'dan attacks with massive green Kamehamehas, since he's imbued with Legion power. Near the end of the fight, a rift starts to appear showing the Twisting Nether, the depths of space. 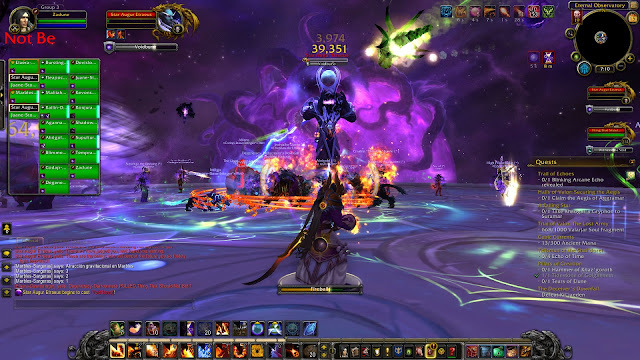 Once I finished off Nighthold, it was time for Tier 3. This is where the fights start to become a bit more intense and less likely to just roll over for the players. "Gates of Hell" is apropo, because this is also where we start fighting the Burning Legion itself head-on. Green fire and waves of lightning abound. To go along with this, I also played open-world Suramar and Broken Shore. 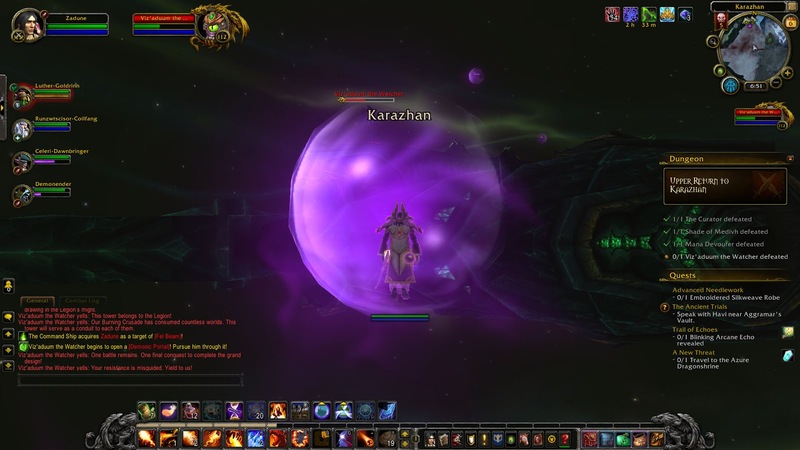 Haven't gotten to Argus just yet. Much like the dungeons while leveling, it's easy to do all of the raid tiers way before progressing into the matching open world areas unless you purposefully limit how far you go in the raid cycle. 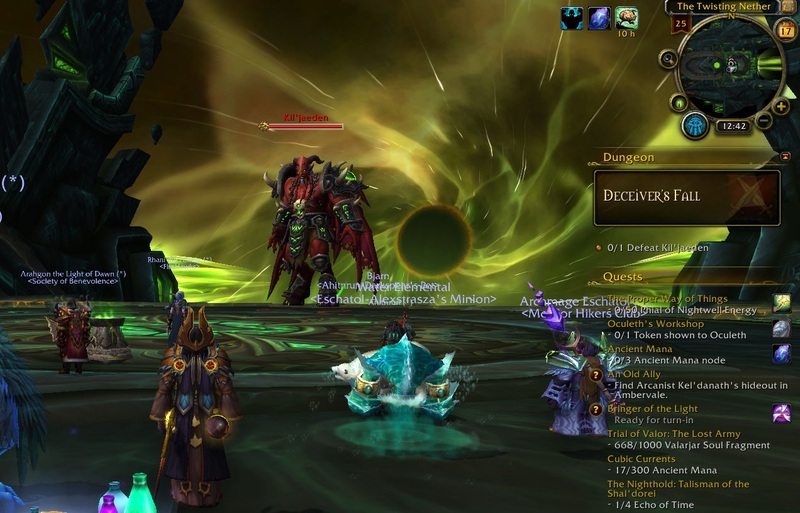 At the end of the Tomb of Sargeras, we find the Avatar of Sargeras. This is about as close as we ever get to fighting Sargeras in the game. He's the ultimate villain, but he's also the size of a planet. 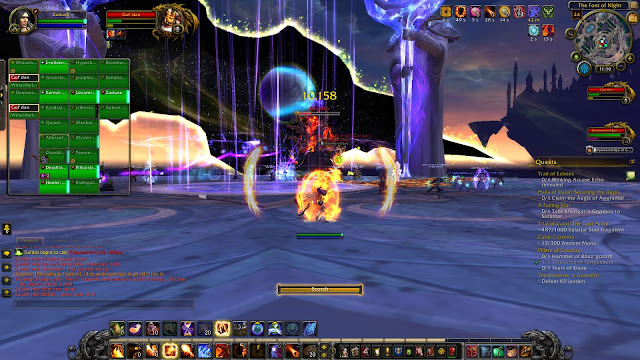 Still, merely fighting his avatar is cool in and of itself. 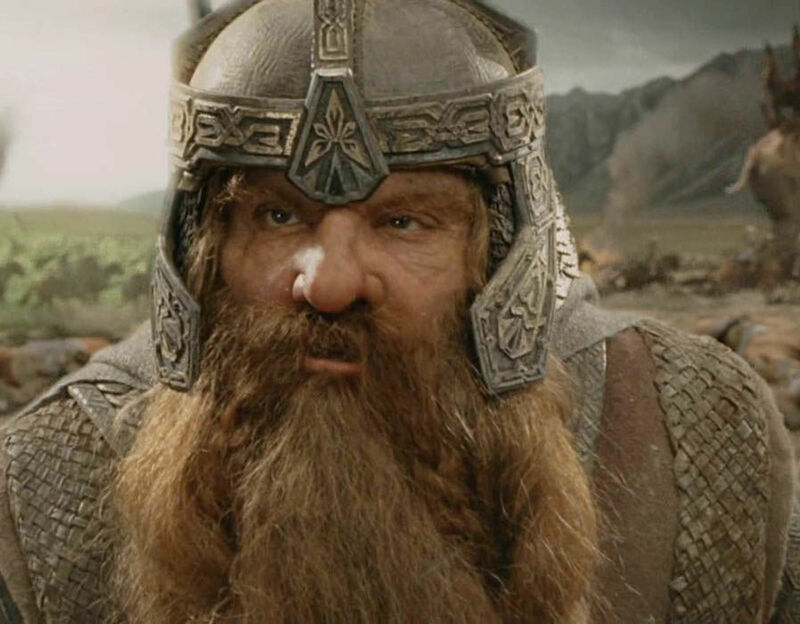 It's a good look at the head honcho behind the storyline that has dominated two expansions and loomed in the background of at least one other. Midway through the fight, the space overlord ('s avatar) roars up out of the ground and marches around the room mauling people with his massive sword. ...sword? Are we sure that isn't technically a mace? Or a club? Defeat the avatar, and the Tomb of Sargeras is technically over. There's one fight left though. At this point Kil'Jaeden (Burning Legion second-in-command) tries to escape the tomb, taking off for Argus on his flying ship. The flying ship in question is full of Burning Legion stormtroopers as super-menacing music plays. Matter of fact, let's have some of that super-menacing music. Defeat his guards and reach the top of the ship to find Kil'Jaeden. The ship is flying into the Twisting Nether, which is the only place where Burning Legion higher-ups can be perma-killed. So...yeah, that isn't very smart. We can defeat him here, AND his ship is taking us right to his homeworld. Midway through the fight he borrows Ganon's lights-out trick from A Link to the Past. I really need to cover that game on here. He can't be damaged until the lights go back on and he's spotted, which means finding the light source NPCs and re-activating them. Speaking of SNES classics, here I use one of my more useful Mage abilities to prevent my own demise: The ice-block move Ozzie used to make himself invincible in Chrono Trigger. It's good to use when you find yourself in a pickle. 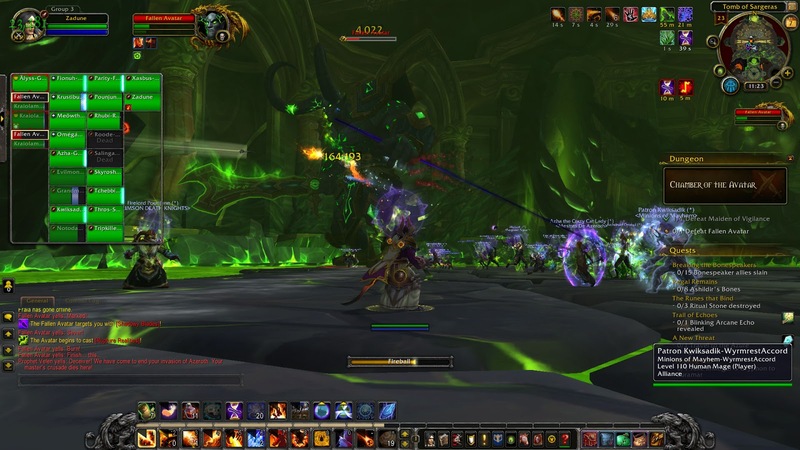 Kil'Jaeden is the most difficult fight up to this point by far, and makes most of the Tomb of Sargeras fights look easy in comparison. 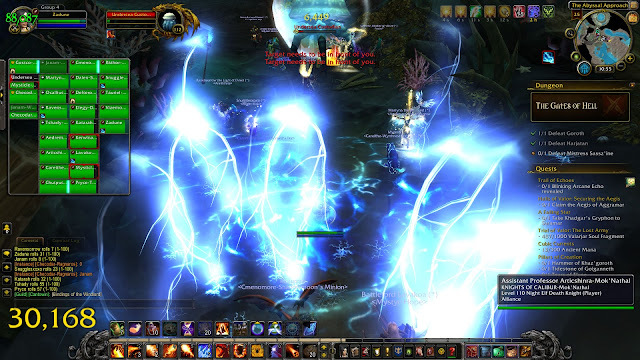 He unleashes a ton of damage and healers have a lot to keep up with. 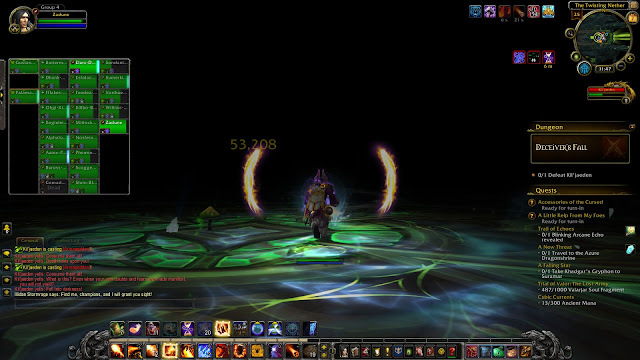 He also tends to fly off a lot, severely hampering the DPS. Here he is unleashing a whirlwind attack. 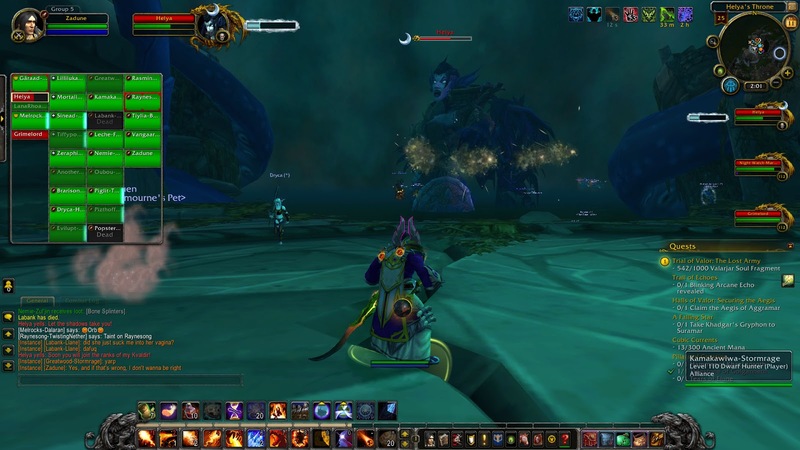 Over the course of the fight, Argus itself comes into view in the background. By the end of the battle, Argus is looming large. 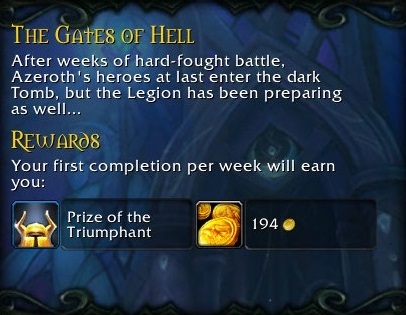 That's the next tier, the final destination of the expansion, the last battle with the Burning Legion, and more likely than not the end of my already very sporadic WoW playing. Seems like a good place to end the crusade. The descent begins as I get ready to head to Argus. Tune in soon for the exciting conclusion. Some nice looking locations here. The phoenix looks as great as ever too.